Sometimes those paper-light Payless sneakers aren’t going to cut it when it comes to trail blazing. And if your pint-sized adventurer plans on hitting the trails just like mom and dad, or chasing crows down by the river for hours, you’re going to need a reliable boot that can keep your kiddo's toes comfy and protected. 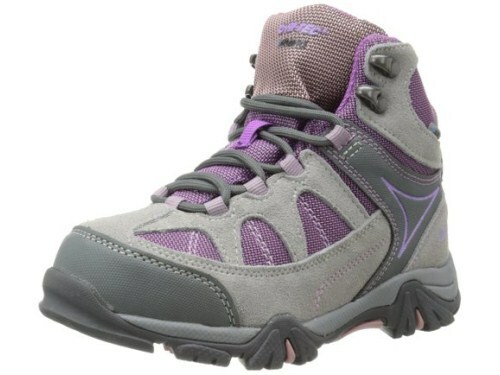 You need the best girls hiking boots available. **Below, you'll find our detailed reviews, but you can also click the links above to quickly check the prices of our top 3 picks for girls hiking boots in 2018. If you are taking care of kid(s) you probably don’t want to spend hours online researching the perfect pair of children's hiking boots. So we have done all the work for you and found the 6 very best girls' boots, so you can have a few more precious hours back in your parent pocket. 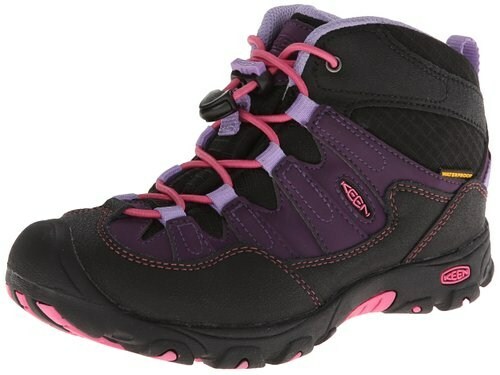 Here is our in depth review of the 6 best young girl’s hiking boots on the market today. When it comes to hiking footwear you have two options: shoes and boots. Hiking shoes are lighter and more flexible and best suited for short, well-groomed trails. The flip side is that they offer far less support and those lightweight hiking sneakers aren’t going to cut it if your little lady is carrying a loaded backpack. Boots, on the other hand, offer far more heavy duty protection, despite the added weight. Features like toe bumpers and partial rands (strips of rubber or abrasion-resistant material) make the boots tough against rocks and stray pokey branches. Underfoot protection (that lightweight plate under the forefoot) helps prevent bruising. Additionally, most hiking boots are leather, suede, synthetic or a combination of all the aforementioned. The general rule is that leather boots are more durable and provide adept ankle and foot stability on tough trails than boots made of synthetic materials. But synthetic boots are not only cheaper, but also a tad easier to break in. Obviously, each kind has advantages and disadvantages, and you will simply have to decide what boots suit your little adventurer's particular needs. During this vetting phase you are going to need to keep expected weather conditions in mind because the truth is that typical hiking boots for girls are more water resistant than water proof. So if you plan to brave the rain and snow, you will want to select boots that are constructed for those conditions. Keep in mind, though, that waterproof shoes are often hotter and stuffier than non-waterproof ones. First of all, when trying on the new hiking boots your kid should already be wearing the socks they’ll be hiking in. There are a few key indications that the boot fits: first is that the shoes are snug but there is ample room to wiggle toes (about half an inch). Then have your kid kick the floor—(not too hard though, in my experience kids are overzealous about this step sometimes) and if the fit is good, their toes shouldn't hit the end. Also, they shouldn't feel their heel lift or slip as they walk around, and they must be able to comfortably slip their index finger in between the heel and the back of the shoe. If you buy the boots at a store have your child do a lap around the store before you head towards the checkout stand. If you ordered boots online, do the same at home because if the fit is wrong from the start, stores are hesitant to accept returns that look like they hit the playground hard. Whether you opt for shoes or boots, you need to pay special attention to the sole and its traction. Little ones can be accident-prone and a little overconfident on the trails, so you’re going to want grippy soles with deep tread (grooves in the bottom of the boot) so they don’t take a tumble. When it comes to hiking boots for girls I recommend the typical, thorough break-in routine. To start out, have them tromp around the house in their brand new boots and a good pair of thick hiking socks. Then drag that youth around on some errands (grocery store, post office, and if that goes off without a hitch, let them go wild on the playground. Kiddo’s feet are constantly growing, and are thus malleable, so you don’t want them wearing new shoes that will give them cone feet. Proper moisture wicking socks are of paramount importance, but you should also pack some moleskin and duct tape to save you from a few blister-fueled meltdowns. Little adventurous girls have a way of finding stray water puddles and mud pits even on the driest trails. So they’re definitely going to require a deep cleaning after those longer, messier adventures. If you are unfamiliar with boot maintenance then I recommend this jam packed informational video by Backcountry Edge. But if you don’t have enough time to watch an 8 minute video about cleaning girls' hiking footwear (I don’t blame you) here is a summary of the tips—use a toothbrush for cleaning out sand and dirt from cracks and creases in the boots, remove that sweat-soaked insole periodically and wash it, buff your boot's fabric with water repellent leather conditioner to revive the material, don’t expose them to high heat, and keep them out of moist closets. Boots that are used in damp, muddy weather are going to need some more TLC. But the goal is to make these boots last as long as they can before your little mountaineer grows out of them. 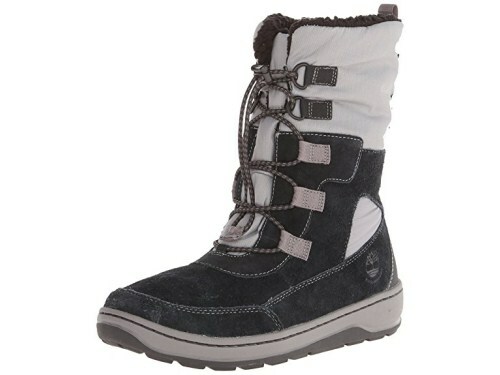 The Timberland Whiteledge WaterProof Hiking Boot is a leather and fabric shoe made for kiddos. It has the same premium materials and design sensibility as the adult version of this boot (there are no auxiliary light-up soles or plastic neon hearts glued everywhere). Instead this lace-up boot has a seam-sealed waterproof outer layer with a padded collar and tongue and moisture-wicking textile lining. Additionally, its synthetic cushiony EVA footbed will keep growing feet comfy. The shaft measures at 3.25" from the arch and is equipped with a supportive nylon shank to keep wobbly ankles secured and the trip prone upright. The durable non-marking rubber lug outsoles offer superior traction and will keep these boots looking semi-presentable against vigorous scraping, climbing, and bushwhacking. The Merrell Reflex Mid Waterproof Boot is a leather trekking shoe that is outfitted with an impermeable membrane, which seals out water and lets moisture escape so feet always feel cool and comfy, especially in humidity. The hard toe guard will help your child avoid angry stubbed toes and the high cushioned ankle support protects against rolled ankles. The soles are thick and well treaded. Since these boots are fully waterproof, they'll save you from purchasing separate rain and snow boots, because who has enough money to buy little kids three different pairs of adventure boots in a two year span, am I right? The shaft measures approximately 4.5" from the arch. Then the M-select fresh removable footbed helps prevent athlete’s foot and keeps the smelly feet at bay. 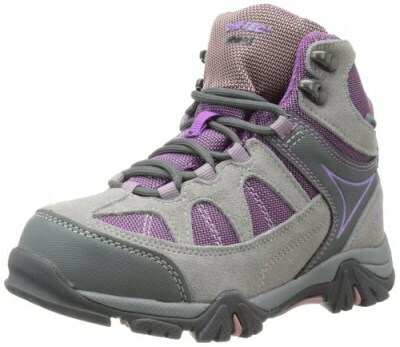 Additionally, the sticky outsole has stellar traction that keeps your child’s feet glued to the trail. 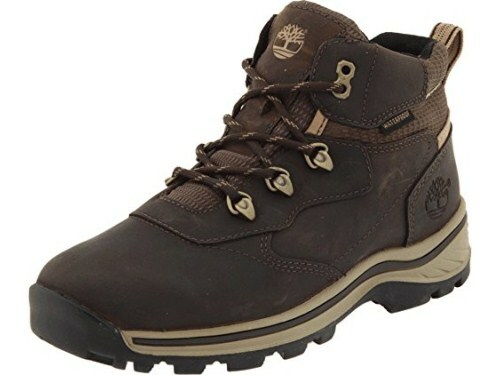 The Keen Pagosa Mid WP Hiking Boot is a well-constructed leather and synthetic adventure boot. It has breathable mesh lining for keeping feet cool and a waterproof leather upper for keeping water out. Rolling ankles isn’t an option with a high shaft that measures at approximately 4.5" from the arch. 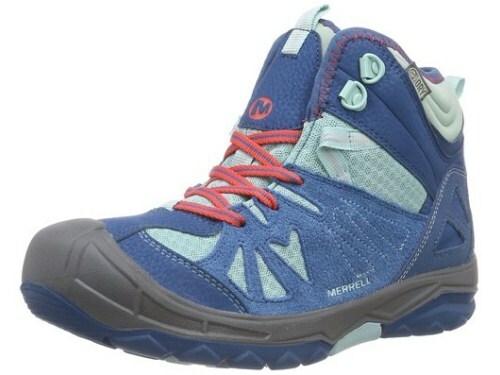 Its thick non-marking luggy outsole provides sure-footing on unsteady boulders and slimy trails. Additionally, it is an extremely comfortable boot. Its padded collar, removable metatomical EVA molded footbed, and a customizable lace capture system, so that even after a few days of backpacking your little girl’s feet will be raring to go. The Vasque Breeze WP 2.0 Hiking Boot is a leather and suede trekking shoe with a hard rubber heel and toe cap. These boots can conquer even the most un-groomed, rocky trails. These boots are feather light but are equipped with some aggressive tread for exceptional traction. On top of all that, they have a cushioned mid-sole, padded tongue and collar for ample comfort. The UltraDry Waterproofing System makes these boots prepped for all the puddle jumping your kiddo desires. Additionally, the Kids Contact is a rubber cup sole designed to comfortably accommodate growing feet. Timberland Winterfest WaterPROof Boot is a suede hiking boot with some serious water fighting power. This heavy-duty shoe features a sturdy waterproof upper with single-pull bungee lacing and rear pull-on loop, and non-marking rubber outsole for durability and traction in every kind of environment. The tall shaft measures at 6" from the arch and the heel measures at approximately 1”. Faux-shearling lining in the ankle and tongue and Ortholite PU footbed makes these some seriously cozy boots, so your kid’s little feet have no chance of getting cold. The Hi-Tec Altitude Lite I WP JR Hiking Boot is a leather and textile shoe that is packed with technology that’ll equip those tiny feet for scaling steep summits and scampering up tall trees. The waterproof suede leather and mesh upper provides durability and breathability, while and the Dri-tec waterproof breathable membrane keeps feet dry. On top of that it, repels clingy dirt clumps, which means less cleanup on your end. The shaft measures approximately 4.5" from the arch and this one is a bit lifted with a 1” heel. Abrasion-resistant toe cap and heel give added protection, the Ghillie lacing system creates a snug, secure fit. On top of all this smart tech, the boots are equipped with a nylon fork shank that provides sturdy support and makes every step more stable. Additionally, the volume adjusting system can increase the usability of these boots by three months, which means less errands and more savings. 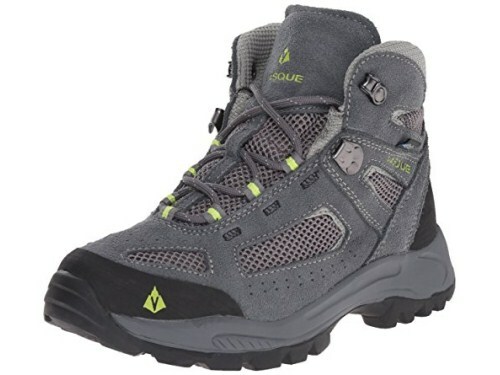 The winner by a long shot is the Hi-Tec Altitude Lite I WP JR Hiking Boot . These girls' hiking boots have every feature a parent could hope for in a boot for their micro trekker. The ghillie lacing system keeps those finicky laces locked into place, Dri-tec material makes the boots waterproof and sweat resistant, the toe cap will protect even the most clumsy pint sized adventurers. Most importantly, the Big-fit system will give your girl’s hiking boots a few more precious months of use. At the end of the day, though, all of these boots will adequately equip your little mountaineers for some frolicking, climbing, skipping and just about everything else you can do on the trails.